As a week full of news gets into full swing, MTV released the first image of its new show The Chronicles of Shannara. 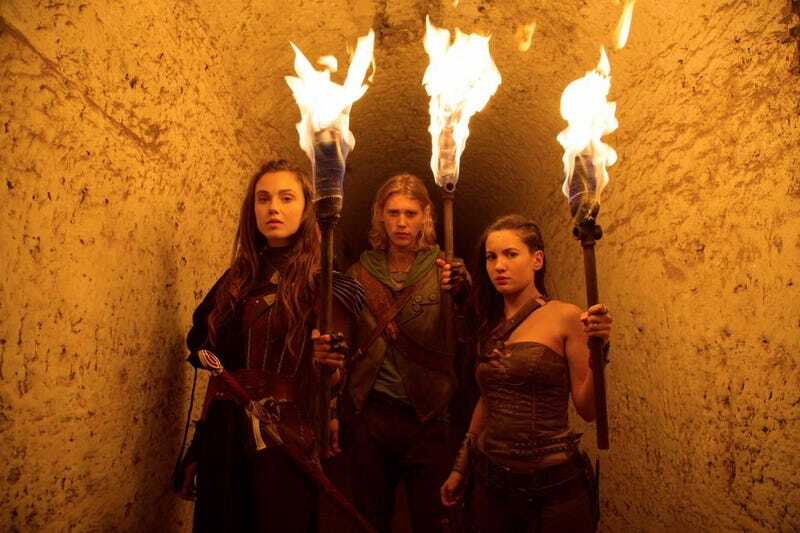 Take a look at Ivana Baquero as Eretria, Austin Butler as Wil Ohmsford, and Poppy Drayton as Amberle Elessedil. MTV’s adapting the second book of Terry Brooks’ post-apocalyptic fantasy series, The Elfstones of Shannara, with the producing help of Jon Favreau and Smallville showrunners Miles Millar and Al Gough. This seems more like a general promo shot and not one with a specific event being represented — it’s a tunnel. But they do seem concerned about whatever they’re looking at. So, does this match the characters you had in your head when you read the book? Or, if you haven’t read the book, is this enticing? It’s just sort of there for me. But it is an interesting path for MTV to take with their scripted shows, so I’m at least curious.